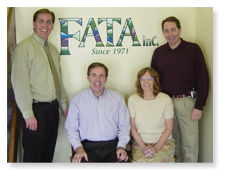 Since 1971, thousands of clients have benefited from FATA's professional and creative publications. As a client, you can be sure to receive prompt and professional service while we work with you in the design and production of your publication. We can do it all from professional, artistic design, to copy writing, to printing. Alternatively, to fit your unique needs, we are willing to target only certain aspects of the publishing process as well. Whatever your publishing needs are, we can satisfy your unique requests, and most importantly, our advertising expertise virtually guarantees that your publishing costs will be lowered or even eliminated! In many cases, through advertising we can completely transform a client's printing and production expense, into revenue. We value our relationships with thousands of advertisers in the mid-Atlantic region, and this puts us in a unique position. We have the contacts and experience to be able to attract and match the best advertisers for the best publications. Advertisers trust and rely on our marketing expertise. In many cases, advertisers work with us on multiple and diverse publications. Advertisers have come to rely on our experience in helping them make decisions on how to target markets and allocate advertising dollars. We bring together the advertisers that benefi t the most for each publication we produce. Thus, we ensure a marketing and publishing "win/win" for both advertisers and clients!